We hope that it never happens, but what if, on some future day, you find yourself stranded on a desert island. Think about the music that you would miss. Could you do without for a long time? If allowed just one compact disc, your tiny castaway collection, can you say which one you would choose? After considering the vast amount of possible options, we’d like to recommend the albums below as ideas for the one compact disc you may want to have the next time you travel. In early August McCartney wanted to record outside the United Kingdom and asked about international recording studios. He selected Lagos in Nigeria, and the band started rehearsals for the new album at McCartney’s’ Scottish farm. After internal disagreements, a few of the band quit, leaving just the core of the band – Paul, Linda and Deny Laine – to record in Lagos. McCartney had chosen Lagos; he felt it would be glamorous and the band could sun on the beach during the day and record at night. The reality was that Nigeria was run by military government and corruption and disease was widespread. In early December 1973, Apple Records released Band on the Run. The commercial reception was initially subdued, the record-buying followers somewhat cautious in light of Wings’ preceding releases. When “Jet” came out as a single in January ’74 it provided new enthusiasm for the album, which hit number 2 in the U.K. at the end of March and topped Billboard’s listings in the middle of April. The debut album from Walter Becker and Donald Fagen as seventies FM masters Steely Dan, Can’t Buy a Thrill, was released in 1972. The hit singles ”Do It Again” and “Reelin’ In the Years” made it into the top twenty on the Billboard singles charts and shortly thereafter the songs became staples on classic rock radio. Versions were released in two-channel stereo and four-channel quadraphonic mix, with an extra lead guitar on the quad mix of “Reelin’ in the Years”. Two songs recorded during the Can’t Buy a Thrill sessions became singles: “Dallas” and “Sail the Waterway”. As the only Steely Dan album to include David Palmer on lead vocals, having been recruited when Donald Fagen expressed concerns over singing live. Drummer Jim Hodder also chips in lead vocals on one song, as well as singing the “Dallas” single. By the time recording of the next album began, the band and producer Gary Katz had convinced Fagen to assume the full lead vocalist role. The BBC review of Can’t Buy A Thrill concludes, “The singles “Do It Again” and “Reelin In the Years” are as beautifully crafted as any AM radio staple, while “Only a Fool Would Say That” is quintessential Dan: mellifluous yet mordant, easy on the ear but as caustic as any dissection of the American dream”. CCR’s Best Album – Great songs! When they released the album Cosmo’s Factory in July 1970, the new project took Creedence Clearwater Revival straight into the big time. Their fifth album in a period of two years, it was an international success, topping the album charts in six countries. The band soon became the most popular band in the states by ignoring the trippy acid rock indulgences typical of the era. Music insiders labeled them as a singles band with no substance. In a 2012 cover story Uncut observed, “While San Francisco longhairs across the bridge scoffed at their commercialism, Creedence henceforth made a point of releasing double A-sides.” The album was CCR’s biggest seller and went to the top of the Billboard 200 album charts and made it to number 11 on Billboard’s Soul Albums chart. The Cosmo’s Factory project brought on stirrings of tensions within the group due to constant touring and overloaded recording schedules took their toll. Tom Fogerty finally had enough of his younger brother and resigned from CCR in late 1970. The band saw the death of Tom Fogerty from AIDS-related complications, a tainted blood transfusion during surgery. John Fogerty has talked about a possible reunion of the remaining members but still no real action so far. CCR’s music is still a staple of U.S. radio airplay; the band has sold 26 million albums in the United States alone. Creedence was inducted into the Rock and Roll Hall of Fame in 1993, and Rolling Stone puts the band at spot number 82 on its list of the 100 greatest artists of all time. Their influential styles are found within modern genres including southern rock, grunge, roots rock, and blues. Pink Floyd came about in 1965 when students Syd Barrett (guitar), Nick Mason (drums), Roger Waters (bass), and Richard Wright (keyboards) met up decided to form a band. They gained popularity performing in London’s underground music scene during the late 1960s and released two charting singles and a successful debut album, The Piper at the Gates of Dawn, from 1967. Guitarist David Gilmour joined in December 1967; Barrett left in April 1968 due to deteriorating mental health. Released in March 1973, Dark Side of the Moon became an overnight phenomenon in the UK and most of Western Europe, earning extremely positive responses from all corners. Pink Floyd – except for Wright – boycotted the press release for the album because a quadraphonic mix had not yet been completed, and they felt presenting their work by way of a low-quality sound system was unjustified. Pink Floyd are one of the most commercially successful and possibly the most influential rock band of all time, depending upon who you ask. To date, the group has sold over 250 million records worldwide, including 75 million in the United States, with 37.9 million albums sold in the US since 1993. A British publication, The Sunday Times, in 2013 assessed Rodger Waters with an estimated fortune of £150 ($219) million, David Gilmour pulled in approximately £85 ($124) million and Nick Mason comes away with £50 ($73) million. Heavy duty hits from AC/DC! AC/DC released their seventh album, Back in Black, in July 1980. In the late 1970s, AC/DC began to gain publicity beyond their native Australia, fueled by their high-energy concerts and a few successful albums. In 1979, they brought on producer John “Mutt” Lange and recorded their worldwide breakthrough album, Highway to Hell. Shortly before the recording of their planned follow-up effort, lead vocalist Bon Scott died after a night of heavy alcohol consumption. Back in Black was released less than half a year after Scott’s death. However, the album proved to ease the band’s worries, as it turned out to become their best-selling and most critically acclaimed album. Not only did it go to #1 on the UK Albums Chart, it put AC/DC up there with The Beatles: four albums in the British Top 100 at the same time. “Highway to Hell”, “Let There Be Rock”, and “If You Want Blood You’ve Got It” re-entered the charts following the release of Back in Black. In the US, the title track, along with “Hells Bells”, “Shoot to Thrill”, “You Shook Me All Night Long”, and “Rock and Roll Ain’t Noise Pollution’ soon were adopted as fan favorites. The other songs on Back in Black were largely ignored after the mid-1980’s. Led Zeppelin got their start in and around the clubs of London in 1968, with guitarist Jimmy Page, singer Robert Plant, bassist and keyboardist John Paul Jones, and drummer John Bonham. Their intense, guitar-driven tunes, influenced by both blues and psychedelia during their initial albums, left them in a position as one of the disciples of heavy metal, although their unique talents are drawn from a diverse field of influences. Led Zeppelin IV for your enjoyment! When their fourth album came out in November of 1971, responding to the treatment they received via assorted music critics after Led Zeppelin III, the fourth album had no title. Known in the record world as Led Zeppelin IV, Untitled, IV, or, in light of four symbols found on the label, as Four Symbols, Zoso or Runes. With some 37 million copies sold so far, Led Zeppelin IV ranks among the best-selling albums in history, and its overall popularity distinguished Led Zeppelin’s status as superstars in the 1970s. By the end of 2006, it has been purchased 23 million times in the United States alone. Fleetwood Mac is also from London, beginning in the summer of 1967. After years of touring and recording, the band took a break in 1974. It was then that Clifford Davis, the band’s manager, claimed that he owned the name Fleetwood Mac, and encouraged the band going by the name of Legs to tour as Fleetwood Mac. After the fake Fleetwood folded in 1975, with a new line-up the group released the eponymous Fleetwood Mac album. The record was a breakthrough for the band and stood out by becoming a major radio hit, moving up to top the U.S. charts, selling over 5 million copies along the way. Spawning several singles, the album featured Christine McVie’s “Over My Head” and “Say You Love Me”, along with two from vocalist Stevie Nicks, “Rhiannon” and “Landslide”. Their 1975 production of Rumours was a huge commercial success and it was Fleetwood Mac’s second U.S. number one record. The highly acclaimed landmark album won the Grammy Award for Album of the Year for 1977. It hung out at the top of the Billboard 200 for 31 non-consecutive weeks, and also topped the music charts of Australia, Canada, and New Zealand. In May 2011 it enjoyed renewed popularity in conjunction with the album being used for a “Rumours” episode of the television series Glee. After achieving Platinum status in both America and the UK months after the release, three major US trade publications — Billboard, Cash Box, and Record World — voted it as the Album of the Year for 1977. With sales exceeding 100 million records worldwide, putting them among the best-selling groups of all time. Several members of Fleetwood Mac have been inducted into the Rock and Roll Hall of Fame, and the group has also received the Brit Award for Outstanding Contribution to Music. When the Beatles permanently retired from touring in August 1966, they took a three-month holiday from recording. While on a flight to London, Paul McCartney had an idea for a song revolving around n Edwardian era military band – the impetus of Sgt. Pepper came about. Recording for the Beatles’ eighth album commenced in late November at the Abbey Road Studios. Two songs, inspired by youth, “Strawberry Fields Forever” and “Penny Lane”, were intended for the new album, but pressure by the record label (EMI), led to the songs becoming a double A-side single and they were not included on the finished album. Sgt. Pepper’s Lonely Hearts Club Band, released in June 1967, was an overwhelming commercial and critical success. It remained for 27 weeks atop the album charts in the United Kingdom and also spent 15 weeks at the top spot in the United States. Time magazine declared it “a historic departure in the progress of music” and the New Statesman praised its elevation of pop to the level of fine art. It went on to win four Grammy Awards in 1968, including Album of the Year, the first ever rock LP to receive this honor. Acclaimed Music calls Who’s Next the 35th record on critics’ listings of all-time greatest albums. Rolling Stone has it in the 28th position on Rolling Stone’s 500 Greatest Albums of All Time. The album appears at #15 on Pitchfork Media’s list The 100 Best Records of the 1970s. It found itself in the book 1001 Albums You Must Hear Before You Die (2005). The Classic Albums documentary series profiled the group and Who’s Next, first via radio during 1989, then on television in 1998. 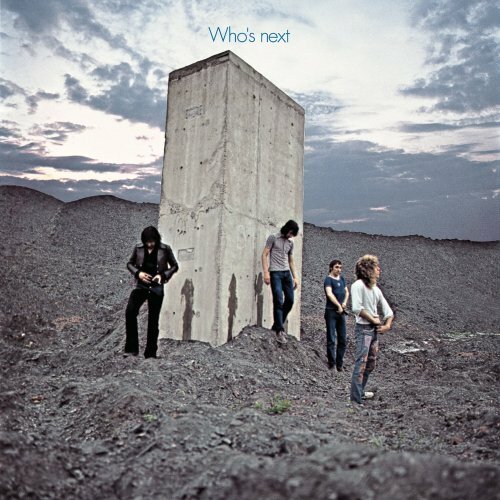 The program was released in 2006 on DVD as Classic Albums: The Who – Who’s Next“. That year, Time magazine named it as one of their 100 best records of all time. In 2007, the album was inducted into the Grammy Hall of Fame for “lasting qualitative or historical significance”. The album cover presents a photograph of the band apparently having just finished urinating on the sides of a very ominous concrete piling protruding from a seemingly endless slag heap. The idea behind the picture came from Entwistle and Moon while in a discussion regarding Stanley Kubrick and the film 2001: A Space Odyssey. Photographer Ethan Russell stated that most of the band members were not able to urinate, so rainwater was poured from a film canister seemed to achieve the desired effect. The rear cover has a photo captured while backstage at De Montfort Hall, Leicester, amidst a pile of scattered furniture debris. In 2003, the television channel VH1 named Who’s Next’s cover as one of the greatest album covers of all time. Order this 180 Gram Vinyl edition! In June of 1972, David Bowie got all spacey and released The Rise and Fall of Ziggy Stardust and the Spiders from Mars (aka ‘Ziggy Stardust’). This inspired and creative musical trek is a concept album that covers the story of a fictional rock star named Ziggy Stardust. Seems that Ziggy was the earthly messenger for an unknown group of extraterrestrials. It rose to the #5 spot on the UK Albums Chart and only got as high as #75 on the U.S. Billboard 200, then rushed into the #21 position in the wake of Bowie’s death. Bowie debuted Ziggy Stardust in New York City while promoting the album Hunky Dory. The Ziggy Stardust persona was known for its glam rock style and hints of sexual exploration and liberal social commentary. Considering the ambiguity surrounding Bowie’s sexuality which was fueled by a ground-breaking performance of “Starman” during a Top of the Pops performance, left the album surrounded with controversy and has since been hailed as a seminal work. In 1987, as part of their 20th anniversary, Rolling Stone magazine put it at #6 on “The 100 Best Albums of the Last Twenty Years.” In 1998, it was named as the 35th best album ever made on the Rolling Stone list of the 500 Greatest Albums of All Time. In 2000 Q placed it at #25 on their list of the 100 Greatest British Albums Ever. In a 1995 publication, The Alternative Music Almanac, Alan Cross picked the record for #3 on his ranking of ’10 Classic Alternative Albums’. In 2006, the album was chosen by Time magazine as one of the 100 best albums of all time. Many more great albums and CD’s could and should be on our list, but that would require yet another set of choices. Let us know what music you’d rather not be without. Perhaps we can help you build your own castaway collection.